We have made a long technical and musical journey and not every album can be presented the public. But these albums are an important part of our band history and that is why we mention them nevertheless. The approaching darkness is falling over slowly and silently and the old year is drawing persistently to its end. A magic night begins, which unites the anticipation's shine and splendour of the new gates, which will open soon, with the nameless fear of the things, which are waiting behind them. Just as a magician performs unbelievable feats with his tricks, everybody knows his own knacks to run the coming year despite its dark sides. But, for the moment, the time seems to stand still and, as if you are caught in a time warp, you believe that the waiting for the new year would last endlessly and never past. And the hope is arising softly in us, that the gates would stay closed to exclude the dark man behind the mask forever from our world, who will follow us with a song feigning happiness and security on his lips. But, nevertheless, the fear and the screams fall silent when, at last, the time has come. The sky begins to burn and thousands upon thousands of stars raining down on us surround us. And as suddenly the wheel of time turns again, we are dancing happily and expectantly in this sparkling New Year, which is opening its locked doors for us. But as fast as the light came, the colours fade and, suddenly, darkness falls over us again and leaves us behind lonely and isolated as someone in a snow-covered hotel faraway off civilisation who looks towards the slowly and hissingly approaching Wendigo. But shortly before we are taken and dragged by him in his eternal realm of shadows, where he threatens to devour us, we are overcame by a narcotic tiredness and, at last, we find relieving sleep in the middle of thousands of colourful sparkling lights. This album carries you to the unknown depths under the earth, through narrow rock corridors and enormous halls, over dangerous chasms and glittering lakes, down deeper and deeper, further and further away of civilization. The sun will never see, what lies hidden there. And in this completely darkness a beam of a lamp touches the strangest works of art, nature began to create eons ago. Our journey is dangerous and long and sometimes we have to be very carefully not to endanger us or this wonderful place. Even if stone seems undestroyable, it can be as filigree and fragile as a human soul. With this pure instrumental album we take you on a journey to a wonderful, dangerous and unknown world. We want to enchant you and show you the beauty of nature, so that everyone learns to love her marvels and tries to preserve them. As an example for the magical beauty of nature, we took the cave driving as theme for this album, because we sacrifice a lot of our leisure for speleology and so we are especially bound to that subterranean world. 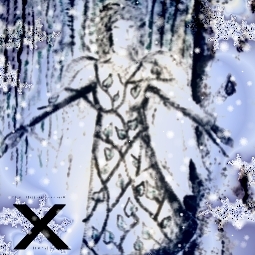 This album was a present to download between 1.10.12 and 6.1.12. Whether there will be any further publication is still written in the stars. A human, hated and avoided of his environment, becomes “Eisheilig” - his heart and the world he lives in turn to ice and the only thing still burning deep inside is yearning for warmth and love. He finds them, but they cannot last in his world and so the last glow in his soul dies and the coldness and his hate are turning against his torturers. In his fantasy his apocalypse befalls the world, but his price to pay is very high. This CD was almost complete authorised by Glöckchen, so the sound became very different from the older once. Less darkly, but of a monotone melancholy. This was the first time for us working with analogue synthesizers in addition to our digital synths. In our opinion, some songs unfortunately do not reach the perfection of others. Nevertheless, on the whole, we think X is a good album. We tell a tragic lovestorie of a female vampire, who falls in love with a human. But this love demands its blood toll. To stay with her for all the time, he has to make a fatal decision. He regrets it soon. But true love cannot die and so there is only one way left for them and their love for eternity. Authorised almost completely by Glöckchen and based on an idea, we already tried to realize with our former medieval band, our second opera was created. There is often a medieval touch, but always in an electronical manner. Technically we had upgraded for this cd, but still it was not enough for standard cd qualitiy. 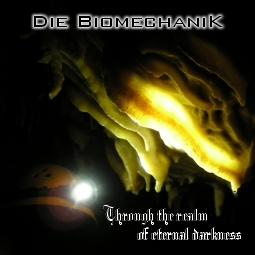 Our first album besides the experiment "the Biomechanik-Trilogie" showes a destroyed soul, which rescued itself after a lost love in a orange dream world, where its real self lies. But this world changes abrupt and shows its real, terrible Face. Swallowed of Orange the broken man finds himself in the hereafter, because his journey through reality ends in a car crash. This work was the beginning of our synthesizer-career. For the first time we worked with an old digital synth and some synthesizer emulation. The result was the beginning of a new time for us, the farewell of our hometown Kulmbach, the removal of our studio to Nürnberg and the final conclusion with uncomfortable memories. Unfortunately we had no proper technical equipment during the recordings for this album. You hear that clearly from the bad sound of the recordings. 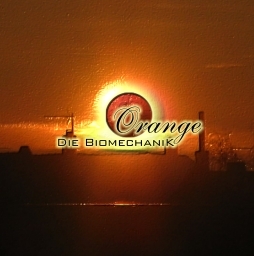 Everything started with a trilogy of short stories, authorized by Dr. Dan in 1998 under the title “Die Biomechanik”. The first part of the unreleased stories tells of a human who ekes out his LEBEN (Living) in a geisteskrank (mental diseased), technical world, where impersonality made the humans to soulless beings, more or less acting and thinking like machines. He escapes by using drugs out of this world and in an gloomy dream state to retrieve his own Ego, which he had lost piece by piece. But a third ego rules this dream world, an ego, which has already mutated completely into a machine. He takes over the mind and awakes in reality. He transforms his wife, who gave him anything different but love, to a human-machine, too, and sends her out into the world, to found the reign over humanity. In the sequel, there are only two human left on earth, remaining lonely in a fort and there they are waiting in an “WACHTTURM” (watchtower) for the arrival of the machines. Still love and humanity rests in their hearts, that is why they were spared until now. But they cannot escape their destiny. The prophecies become reality an the last spark of love is wiped out of the world. In the last part the "Hero" of the first story really awakes of his delirium. He recognizes, that all has been a dream: the machines, the watchtower, his biomechanical self. Freed from all he gains new courage to face life, he enjoys the beautiful things on earth and the love of his wife again. But also this love finds a sudden end and all leads to VOLLENDUNG (completion) . This story trilogy was set to music on three cds between 1999 - 2007, partly with another line-up. Unfortunately the quality of sound was anything but good, however some of the songs became cult songs in our hometown Kulmbach. 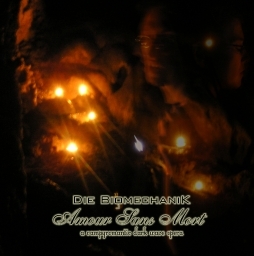 In 2006/2007 we managed with some other musicians the project “Die Biomechanik” was performed on stage. 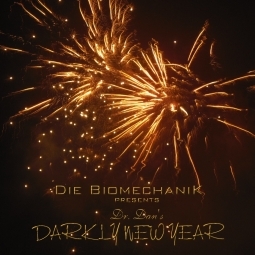 Even if the name "Die Biomechanik" originally just was the name of this project, we decided to keep this name as official band name.